Factual error: When the team is running you can see a new model white Range Rover Sport and a red Honda Civic passing by. Factual error: During the final, in one of the scrums you can see a player wearing Nike Tiempo boots. These weren't released until the mid 2000's, and the film is set in 1995. Factual error: The plane's approach at the final was announced before hand on the stadium's PA system. Mandela's security attachment would have known about this and not acted in the way they did. Factual error: The first game Mandela attends (against England) is shown as being poorly attended, but it was actually sold out. 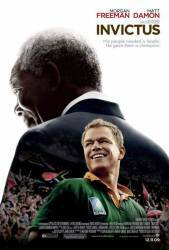 Factual error: In the scene towards the end of the film where Mandela is leaving the stadium after the final match, the vehicle he is travelling in has a modern registration plate with a "GP" (Gauteng Province) suffix. These only came into use well after the World Cup. Interestingly, other vehicles shown in the scene (and in other scenes as well) have historically accurate "T" (Transvaal) suffixes. Factual error: During the match against England, the PA announcer mentions the try scorer as 'No. 13, Ben Clarke'. Ben Clarke actually wore No. 7 - No. 13 in that game was Will Carling (England captain none the less). Factual error: The Gilbert balls used in the film were all released after 2000. The balls used in the 95 World Cup (as seen in the photos in the end credits) were of a much simpler design and pattern. Factual error: In the movie SA is shown as having a bad run of results in the build up to the world cup. They were however unbeaten at home after the initial set back against England in the first test in 1994. Other mistake: In the scene where Madiba reads in the newspaper about the Springbok coach and manager being fired, the article's heading reads "Springbok coach and manager axed" but the article itself is actually about the South African and England cricket teams. Factual error: During the scene when the South Africa rugby team is running through the streets, an ADT security logo is visible on one of the buildings. This security company only became present in South Africa in 2001 and the movie is set in 1995.